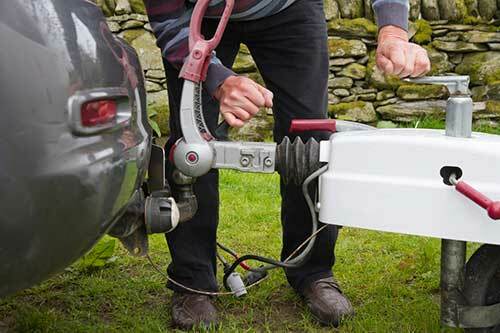 Caravan storage can be tricky for many customers. If you've got a drive big enough to store and secure it, you're one of the lucky ones. Many of us have to keep tourers in storage and get them out when we need them. A safe place for your caravan is important, but some caravanners might be surprised to find that where you keep your caravan has an effect on your insurance policy too. The more security measures you can put in place the lower your premium. If you're using a commercial caravan storage site there is also a rating system for security and levels of service. Generally the higher the rating the lower you caravan insurance premium will be. Let's a take a quick look at the usual places to keep a caravan and assess each one. If you have the space this is the best place to keep a tourer. It doesn't have to be a driveway, it can be in your garden as long as it's within the boundary of your property. It's great if you can put it behind a locked gate or parking post - most insurers will offer lower premiums for that. There's nothing to stop you keeping a caravan on a driveway or garden that belongs to a friend or family member. You can even park it on the street, but some councils can be difficult about it and not all insurance companies will cover you. There is a temptation to allow insurance to lapse over the winter months when your caravan isn't being used. Unfortunately both theft and arson of caravans on driveways are on the rise, so be aware of the risk. There are lots of options for off-site storage, with varying degrees of security and charges. Whether you'll be covered for insurance, and whether there will be an effect on your premium, will depend on the site. At the lower end you might be able to find someone who will allow you to park up on an industrial site or other unofficial space, but not many insurance companies will cover you. Most caravan sites offer storage for caravans throughout the year. There are also specialised commercial storage yards and buildings which take caravans, boats and other items. Many of these sites will have joined the Caravan Storage Site Owners Association (CaSSOA) system. The higher the rating for a CaSSOA site the higher the charges are likely to be, but this can be offset to an extent by lower caravan insurance premiums. And you'll feel safe in the knowledge that your caravan will be as secure as it possibly can be.